WHO: Teachers looking for a way to engage students while they test financial questions. HOW: Students go to http://www.practicalmoneyskills.com/games/trainingcamp/ff/play/. They select Single Player or Head to Head then they choose difficulty (age level: 11-14, 14-18, 18+), and game length (5, 10, or 20 minutes). After choosing the teams playing, followed by a coin flip, the game will begin. The game starts with kickoff to determine where on the field the game will start. The plays on the field are determined by whether or not that students answer questions correctly. Students are given the choice over Easy, Medium, or Hard difficulty with each question. If the player on defense answers a more difficult question, the offense will most likely lose yards. If the offense answers correctly, they will gain. Highest score at the end of the time period wins. WHEN: Financial Football is a great way to review materials covered in Personal Finance. There are no options for teachers to select/write questions, capture data, review results. Students interested in football will be engaged, so this may be an interesting option for a whole-class review game before a test. WHO: Teachers looking to engage students in math content. HOW: Without creating an account, a user could select a game, standard, or skill, and start playing within seconds. Accounts allow students, parents, and teachers to track progression of skill mastery. Games and skills are Common Core aligned. WHEN: Math Games would work well in a station setting, enrichment activity, test prep, and more! WHO: Teachers looking to help ease students who suffer from test anxiety. HOW: Teachers create an account, create a class, and have students sign up via class code. Teachers then assign challenges to their classes. Students take these challenges and compete against each other. Questions are put into a game, correct answers give students a boost. WHEN: This is a great tool for test prep, extended lessons, and extra practice. Some students need a game based environment in order to be engaged in the content. Class Compete also captures students attention by allowing them to customize their characters. WHO: Teachers looking for a way to engage students in practicing math. HOW: Sumdog can be used independently by students. 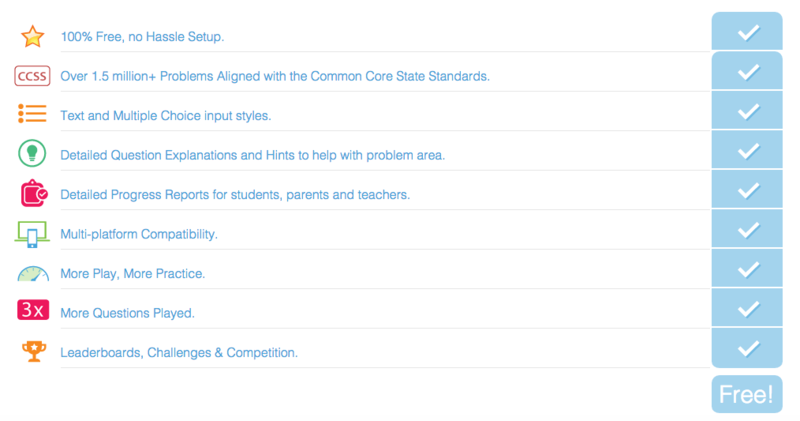 However, teachers can also create an account, class, and view student progress. Students are able to compete in a variety of games that allow them the practice they need to strengthen their math skills. Students also are rewarded with coins that can be used to purchase “pets”. Click here to learn more about how Sumdog builds these math skills. WHEN: Sumdog would be great for enrichment, after a lesson, or at-home practice. Sumdog uses the “Freemium” model, while they do offer many great tools and games for free, you will want to take a look at their pricing page to see what else is available.